Happy Birthday to me!!! I am one of those people who loves their birthdays. I always celebrate it no matter where I am. This birthday I will celebrate it twice. Once with my closest ones and the second time with my friends (girls only, exciting right?). For this bday I decided to make a cake. And if I make something I want it to be as healthy as possible. Plus it took me only less than an hour. I am not a vegan but I prefer this type of food. 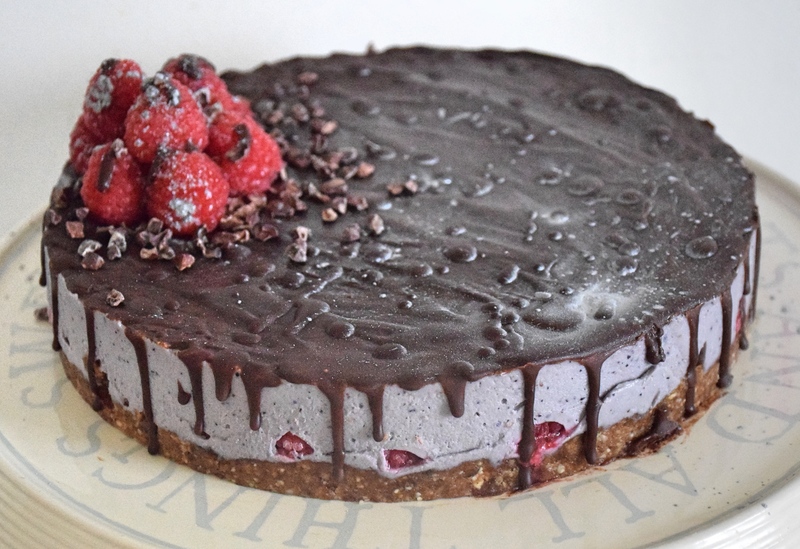 This is why I made this raw vegan cake for me and my family. I won’t feel guilty to give a piece of it to my kid. To make the base, put the hazelnuts, dates, almond butter and cinnamon in a food processor. Process until well combined and sticky. Set aside. To make the filling, drain and rinse cashews and process with coconut butter. Add the vanilla, blueberries and agave and process until smooth cream. Press base into 16 cm round cake tin lined with baking paper. Spread the blueberry filling cream and freeze for 1 hour. To make the chocolate melt the cocoa butter and add the cacao powder, vanilla and cocoa powder. Take the cake out of the freezer and spread the chocolate all over the cake. You can decorate the cake with some raspberries and cocoa nibs. Enjoy !!! Сложете лешниците, фурмите, канелата и маслото от бадеми в блендер. Блендирайте до получаването на финни трохи. След това сложете в кръгла тава 16 см като притиснете много добре с лъжица блата. За да направите крема. Сложете всички съставки в блендер и блендирайте до получаването на гладък крем. Сложете крема върху блата и сложете във фризер за 1 час, за да стегне. За шоколада, разстопете какаовото масло и сложете вътре ванилията, агавето и какаото. Изкарайте тортата от фризера и сложете отгоре шоколада. Може да окрасите с малко малини и какаови зърна.